Many services and programs exists to assist seniors with their transportation needs. VTA is committed to providing services that meet the needs of the senior community, take seniors where they want to go and make the experience pleasant. To help our senior riders learn how to better use the VTA system, we offer the training and excursions called “Daycations.” A VTA speaker hosts morning trainings immediately followed by a free guided bus and/or light rail ride to entertainment or shopping venues of their choice in Santa Clara County. As a safety measure, a VTA bus operator can stop at a location that is closer to your final destination than the regular stop, providing it is along the designated route. This service is available after evening peak hours until the morning rush hour, and is for deboarding only. It is available upon request and will be provided only when and where the operator feels it is safe to pull over. Passengers with disabilities who can’t use fixed route bus and light rail may qualify for paratransit service. Paratransit service provides qualified passengers door-to-door, shared ride service for a premium fee. As an added benefit, qualified paratransit riders, when able can ride bus and light rail free. 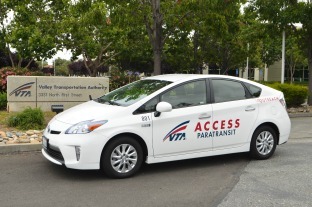 The passenger must have their ACCESS Paratransit Picture ID card for free service.